In the early 90’s, I was a victim of abuse at an Ethnos360 boarding school. Over the past decade, the betrayal I have felt from the leadership of Ethnos360 has been far deeper than that of my abuser. Through their manipulation and misleading of former missionary kids (MK’s), rather than bringing healing, Ethnos360 has instead victimized the survivors of abuse entrusted to their care. In 2012, Brian Shortmeier, the Director of Child Protection, and an NTM USA (now Ethnos360) Executive Board Member, wrote former mission kids, alerting us to what was called an “independent investigation process” led by IHART. Apparently the key word was “process.” Every missionary kid I have communicated with understood it the same as I did; that it was an independent, outside organization, contracted to investigate allegations in the same way that Ethnos360 had previously hired GRACE to investigate the Fanda boarding school run by Ethnos360. I immediately reached out to IHART, not knowing it was actually a part of Ethnos360, to tell what I knew of abuse that happened to myself and others during my time at Tambo. I spoke with four investigators at length (all former detectives and police); I can only say good things about them. They were hired to travel the world, following up on every individual like myself that had come forward – my interactions with the investigators has me convinced of their desire to see justice happen. It was both painful and cathartic; I was shocked to find myself breaking down and sobbing as I gave the details of what I had witnessed and experienced during my time in Bolivia. In a private Facebook group of other MK’s from Bolivia, I loudly affirmed to hundreds of my fellow MK’s that despite their mistrust of Ethnos360, they could trust IHART. And then something completely unexpected happened. In November of 2014, an email was sent to MK’s who had participated in the investigation to let them know that Ethnos360 was removing Pat Hendrix as the lead of IHART and that Ethnos360 was placing one of their attorneys, Theresa Sidebotham, in charge instead. In what world is the client of an independent company allowed to get rid of the lead person and replace them with one of their lawyers? Had Ethnos360 been still working with GRACE, they would not have been able to get rid of Boz Tchividjian and replace him with a person of their choosing. Ethnos360 was able to do this because IHART is Ethnos360. The “independent” process was not hired by Ethnos360; it was formed by Ethnos360. The trademark for the name IHART is registered and owned by Ethnos360. After this came out, I was one of many that voiced my anger and feelings of being misled. The response in general from Ethnos360 was that we had somehow not paid attention enough, or misunderstood their use of the word “process.” I felt as though we were being patronized. In an email conversation from February, 2015, between myself and Theresa Sidebotham, even she, who had been serving as one of Ethnos360’s lawyers through all of this before being appointed in charge of the IHART process, wrote; “I too misunderstood the structure of IHART initially, believing that it was Pat’s organization.” Clearly, not only did Ethnos360 not communicate the nature of IHART accurately to MK’s, even their own attorneys did not fully understand it. This intentional misleading happened in public communications as well in an effort to have the appearance of doing the right thing while retaining control and setting the narrative; in a 2013 interview a Chicago Tribune reporter was told that Ethnos360 “commissioned another agency to investigate similar claims in Bolivia, Panama and Brazil” after parting ways with GRACE. “Commissioned another agency” is not remotely an accurate description of the relationship between Ethnos360 and IHART. For years I hoped for a positive outcome to these investigations. Instead, I have felt misled by the organization I trusted to do the right thing. I, and countless other missionary kids, were betrayed by Ethnos360’s process that led us to believe we were talking to an outside organization comparable to GRACE, only to find out that Ethnos360 had retained full control of the investigation and our stories. As I mentioned in a previous post, it came out in the ABWE report regarding abuse in their mission that leadership in Ethnos360 gave them advice to avoid truly independent investigation groups so they could “control the information” (p. 254), advice ABWE wisely chose not to follow. And ultimately, rather than release the names of the abusers they have discovered, as every other organization in recent years has done, Ethnos360 continues to hide and protect the identities of the abusers, content that they are no longer in their organization, with no thought to the damage they may be causing elsewhere. This is why the betrayal I feel from the leadership of Ethnos360 cuts far deeper than the abuse I suffered at Tambo. Abusers are sick. But the leadership of a large mission organization? They should “care for the least of these” (Matthew 25), not the risk to their bottom line. And they certainly shouldn’t protect themselves by leaving survivors of abuse feeling betrayed and used. This one-off message on Obadiah explores the history and relationship between the Israelites and the Edomites, challenging students to ask the question, “do I find my joy in my enemies’ suffering, or in their salvation?” Do we have the heart of God for the world around us, or would we prefer to see only those we like to know God? When he’s calling out these kinds of thin beliefs, the ways we allow ourselves to be distracted, disconnected – Noble really hits his stride. His challenge to live a life of faith that brings a witness to the world around us is a strong one. I found those parts of the book deeply compelling. In other parts, he critiques contemporary worship services, expresses his dissatisfaction with Vacation Bible School, and other modern attempts to bridge culture and faith. I wasn’t convinced that he was right that these approaches are wrong – just that they don’t resonate with him and his pursuit of God, and even found myself somewhat frustrated with his conclusions in those areas. Overall, I’m glad I read the book. Having said that, it was a bit of a mixed bag for me; parts I loved, parts I found frustrating. Images/signatures from the report packet I was issued by Ethnos360/New Tribes Mission regarding abuse at Tambo. 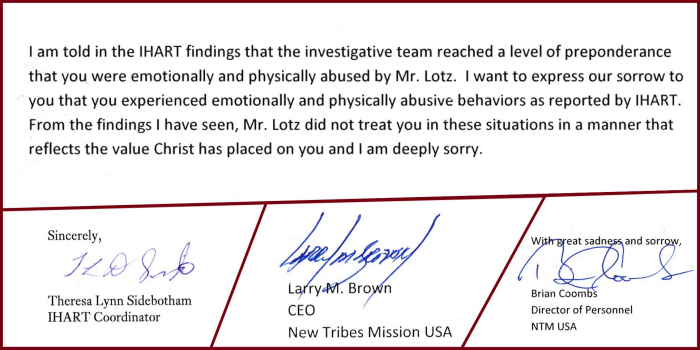 According to Ethnos360, I was physically and emotionally abused by Al Lotz as a fifteen year old at Ethnos360’s (formerly named New Tribes Mission) boarding school in Bolivia. After two and a half decades, and years of investigation, the mission has found a “preponderance of evidence” to support this allegation, however, they would prefer that we keep this uncomfortable truth confidential. In fact, the confidentiality extends to the extent that they will not reveal to me what they have done with this information, other than to tell me they have responded in some way. I find this hard to believe. After decades of hiding abuse, I am expected to simply trust that they have now responded appropriately and I do not need the details. Somehow, Ethnos360 and my abuser get to know all that happened to me, but it is not necessary for me to know how they responded to him. I know I was only one of many victims of his from just my few years at Tambo; some of my friends suffered far worse. Yet more than half a decade after I disclosed my abuse, and more than two years after the investigation was concluded, he continues to serve as the Senior Vice President of Surge International, a mission dedicated to children’s ministry through soccer. Did Ethnos360 truly do all they could to notify authorities and organizations what they had discovered about his abusive past? More alarming, there are at least 41 such alleged abusers out there that Ethnos360 continues to refuse to name despite collecting a “preponderance of evidence,” putting countless potential new victims at risk each day. Fanda, Senegal; this investigation was led by GRACE, an independent investigation team. They discovered through their investigation 12 abusers, who they named and gave information about the nature of their crimes in the report they issued. Vianopolis, Brazil; this investigation was led by IHART, a “process” later revealed to be under the umbrella of Ethnos360, in spite of being described as independent. The Vianopolis report was compiled under the leadership of Pat Hendrix, former director of IHART, and named 6 abusers and a brief description of the categories of abuse committed. Panama; this investigation was led by IHART, initially under Pat Hendrix, and then by Theresa Sidebotham, an Ethnos360 lawyer who they transitioned to this role partway through the investigation. The report issued about Panama acknowledged 10 abusers with a preponderance of evidence, as well as 10 additional alleged abusers that did not have a preponderance of evidence to support an allegation. However, this report marked a change in approach; no longer would Ethnos360 name the abusers or alleged abusers. Tambo, Bolivia; this report was issued by IHART, under the leadership of Theresa Sidebotham, December, 2016. Through their investigations they found a preponderance of evidence identifying 31 different abusers. Also mentioned in the report was that there were additional alleged offenders that they could not find a preponderance of evidence regarding (in other words, no witnesses to support the allegations of the victims), however, the number of alleged abusers was not identified, and again, no names were released. Paraguay; I was shocked to discover that IHART completed an investigation, under the leadership of Theresa Sidebotham, into the Paraguay field this past December. My shock is due to the fact that I was an MK from the Bolivia and Paraguayan mission fields and was never notified that such an investigation was taking place. My parents were actually transferred to Paraguay to replace a man who was discovered to be molesting Manjui children (he was returned to the States with no notice to the Paraguayan government, whose citizens he had been molesting, or American authorities). This investigation marked another change in Ethnos360’s processes; they would no longer notify former missionary kids of investigations, and they would no longer make the summary report public. Consequently, it is unknown how many abusers they identified, and how many alleged abusers there are that they could not find a preponderance of evidence to support an allegation. In total, Ethnos360 has identified so far – that they will acknowledge, with a preponderance of evidence, 59 child abusers, as well as an undisclosed number of alleged abusers (this does not include Paraguay as they have not released those numbers). Of these 59 abusers; men and women who beat children so severely they are physically scarred to this day, missionaries under the charge of Ethnos360 who raped, molested, threatened, shamed and humiliated children, they have named 18 from the first two investigations. They know of 41 child abusers from Panama and Bolivia, men and women that they have collected the evidence and have done their due diligence to back themselves up in this claim were they ever to be challenged in court by these abusers (they would never sue for libel/slander, because it would force Ethnos360 to produce all of their evidence, evidence that would be horrific for them to have in the public record), and do not feel that it is appropriate for former students, parents, new neighbors, churches they currently attend or ministries they are a part of, to be aware of the danger they represent. They do not feel it is appropriate to name these abusers, information that would empower other victims they may still be silent to come forward and find healing, to discover they are not the only ones who had their lives devastated by these criminals masquerading as missionaries. I genuinely believe Ethnos360 began this process of investigation into darkness of their boarding school history with the right intentions of bringing these awful truths to light. They have flown investigators around the world to collect the stories and spent years looking into allegations. My speculation is that, to the Executive Board’s shock, they have discovered that the abuse was far more horrific and widespread than they ever imagined and their fear of becoming vulnerable as an institution has led them to make these final steps in such a tragically wrong direction. Rather than giving the victims the validation and healing they so deserve, they have instead chosen the path of continuing to hide and protect the abusers, and ultimately themselves. It came out when ABWE released their report prepared by Pii, and independent investigation organization regarding abuse in their mission that leadership in Ethnos360 gave them advice to avoid truly independent investigation groups so they could “control the information” (p. 254), advice ABWE wisely chose not to follow. This desperate attempt to control and contain the stories of victims is only increasing the frustration and hurt of those who have been wronged; the vulnerability they fear that would come through exposure is actually the stance that would bring healing, both to the victims and the organization. They need to follow the example of other organizations’ boarding schools, such as The Key School, who just issued their report and publicly named the abusers discovered just the other week. It is the only way to put the victims first; Ethnos360’s current course only protects abusers. They cannot continue to be silent. There are abusers they have identified currently serving in ministries, living next to schools, working with children. How many more have been, and will continue to be, victimized by their decision to keep this information to themselves?